On 23 March, 1983, at Bandaranaike Memorial International Conference Hall, Colombo. In order for the young generation to express their views freely and independently and also to present the same to the Government and the administration as it was necessary to have an organization of their own which expands from the rural level to the national level, Sri Lanka Federation of Youth Clubs which was the national level organization of the youth society/club programme launched under the directives of then His Excellency the President J.R. Jayawardana, has been established. 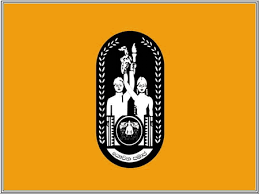 In a background of orange colour, the emblem of youth clubs where a young male and a female wielding a bunch of paddy and a torch also preceded by the National Youth Services Flag is featured in the Youth. Based on the day, 23 March, 1999, on which the Sri Lanka Federation of Youth Clubs was established, 23rd May has been declared the National Youth Day. I, being member of youth clubs, hereby undertake to act based on the four fold assertions of unity, friendship, cooperation and development. Under the establishment and registration of Youth Organizations stated in Section 5 (2) C of National Youth Services Act No: 69 of 1979, Sri Lanka Federation of Youth Clubs has been established as a youth organization. By the Gazette Notification dated 30.05.1979 and under the Section 31 (9) (A) Inland Revenue Act No: 28 of 1979 the Federation has been declared as an accredited charity organization. Under the Section 02 of Voluntary Social Service Organization Act No: 137 of 1980, the Federation has been registered as a social services organization under the registration No: 11/4/1/515/85. Creating opportunity to develop Art skills through Youth Awards Competition. The participation of youth in these programmes will be done through the awareness programmes carried out across youth including the Youth Services Officer who would be in charge of youth affairs in the relevant Divisional Secretariat and the Chairman of the Regional Board of Youth Clubs. The youth are affiliated to the programmes representing Divisional Secretariats at district level. Youth will be selected in such a manner that they will be distributed district wise at the national level. By enrolling in the youth clubs above benefits could be obtained. Taking steps to create a morally accomplished patriotic generation of youth with complete personality and who are dedicated for human development. Building unity, friendship and cooperation within the youth population by gathering them under one organization devoid of all differences such as nationality, cast, religion and political divisions. Creating opportunities for the youth to present their inherent skills and capabilities. Providing youth with the knowledge on the economic, social and cultural requirements related to national development and persuading them for scientific thinking. Persuasion of youth towards the development of Arts, recreational, sports and cultural affairs and the conservation activities. Application of youth labour for development activities of the country and directing the generation of youth towards voluntary services. Adapting the youth towards democratic lifestyle. Utilizing the free time of youth in worthy and productive manner and creating platform for them to present their inherent capabilities and skills. Personality development and leadership training for youth. Providing a training on youth and community development. Encouraging the youth towards strengthening their economy. The official namely President, Secretary, Treasurer, Organizer, Vice president and Vice Secretary of youth clubs established in one Divisional Secretariat Division, and registered with the Sri Lanka Federation of Youth Clubs, shall be permitted to represent the Regional Federation. By the secret votes/ballets of the youth representing the Regional Federation of Youth Clubs, Regional Board of Youth Clubs shall be elected. The Regional Board comprises staff of 15 officials. The Secretary of the Regional Board shall be the Youth Services Officer in charge of the Divisional Secretariat. There are 25 administrative districts operating in Sri Lanka and only the Colombo district has been named under 02 separate divisions for the easy handling of administrative matters. As such the activities of the National Youth Services Council are implemented in 26 districts. A District Federation of Youth Clubs is conducted centering a district and it shall be an associate federation. The District Federation of Youth Clubs shall be convened by the District Youth Services Officer of National Youth Services Council and he shall be the Secretary of the federation. Amongst the President or the Secretary of the youth clubs established in the district and registered with Sri Lanka Federation of Youth Clubs and the Presidents, Secretaries and Organizers of Regional Boards of Youth Clubs, the board of official of the District Board of Youth Clubs shall be appointed. The number of officials appointed for a district board of youth clubs shall be 18.